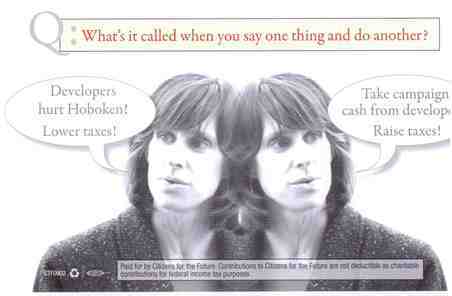 MSV: Hoboken word of Super PAC: "The Developers are coming, the Developers are coming!" Hoboken word of Super PAC: "The Developers are coming, the Developers are coming!" With the August 31 petition filing deadline looming and awaiting the finalized field of council candidates, there's one force reportedly planning entry into the fray which won't be on the ballot come November. On background, one Hoboken politico with strong ties to the Hoboken Reform Movement not employed at City Hall confirmed MSV's inquiry; a developer Super PAC is anticipated targeting this fall's six ward council elections aiming to defeat reform oriented candidates working with Mayor Zimmer. Since becoming mayor in 2009, Dawn Zimmer has urged balanced development. In doing so, she's taken on major political powers inside and outside Hoboken: NJ Transit in the south end and Rockefeller Group in the northwest to name just two. Both entities envisioned huge towers depicted in their graphics 40 stories high. Another long time major local developer with statewide political influence, Ironstate Development, re: the Barry family, is not favorable toward Hoboken's reform movement led by Mayor Zimmer. Both sides are locked in a major legal battle over the former's proposed Monarch towers. To the surprise of no one, developer Super PAC funds would back the Carmelo Garcia Ticket, a likely informal collection of Old Guard candidates historically favorable to doing deals with developers. Beneficiaries on the Carmelo Ticket from a developer Super PAC in no specific order may include: Terry Castellano in the first ward, Michael Russo in the third ward, Ruben Ramos and/or Timmy Occhipinti in the fourth and Eduardo Gonzalez in the fifth. The second ward appears to be leaning to a run by favorite son Peter Biancamano unless "Develop or Die" Beth Mason follows through with a petition filing. High on the target list of the developer Super PAC will be City Council incumbents fifth ward Councilman Peter Cunningham and sixth ward Councilwoman Jen Giattino. Both have records of major legislative successes with each serving as Hoboken Council President and effectively working with Mayor Zimmer. In the second ward, Tiffanie Fisher, an anticipated reform minded council candidate is viewed as a high value target of the developer Super PAC. Fisher is the condo president of the Hudson Tea Building and a years long community leader in opposing Ironstate Development's proposed Monarch towers on a northeast pier. A court battle ensued after the Barry Family re: Applied Housing (and its subsidiary Ironstate Development) reneged on completing tennis courts and parking uptown after the City of Hoboken granted it rights to build and complete The Shipyard project, 1,160 units of condos and rental space on Hoboken's northern waterfront. That legal war is continuing with the City of Hoboken joining the fight against Ironstate Development in both NJ Superior and federal courts. A developer Super PAC would leverage pressure testing the grass root Reform Movement's success in recent years when Dawn Zimmer became acting mayor in the summer of 2009 after Peter Cammarano's arrest and resignation for taking $25,000 in what he thought were secret developer bribes. In that 2009 mayoral runoff between the two, a developer led midnight flyer attack in tandem with others made scurrilous attacks on mayoral candidate Dawn Zimmer portraying her as a recipient of developer support in an attempt to propel Peter Cammarano into the mayor's seat. They're back! In the 2009 mayoral runoff this midnight flyer came to the aid of pro-development then mayoral candidate Peter Cammarano. MSV has learned a developer led Super PAC is planning a return visit to Hoboken in an effort to overturn the reform oriented majority on Hoboken's City Council this fall. No small irony, it was Peter Cammarano at that very time who was the statewide object of affection of developers including one Solomon Dwek who had flipped after being caught in million dollar real estate swindles and became an FBI informant. In the summer of 2011, Hoboken's City Council passed an updated pay-to-play ordinance focused on anti-wheeling and setting strict limitations on political committees making contributions to Hoboken candidates running for elected office at City Hall. Its passage came after months of squabbling and a successful blockage by the Old Guard council. Councilwoman Beth Mason who briefly chaired the council complaining vociferously along with Timmy Occhipinti claiming the proposed ordinance illegal. A similar ordinance was already on the books in several other New Jersey municipalities. No legal challenge was filed by the Mason family. The revised anti-wheeling ordinance would finally pass 5-4 on July 1st, 2011 when Councilwoman Jen Giattino was sworn-in replacing Nino Giacchi in the sixth ward. Council members Michael Russo and Terry Castellano joined Mason and Occhipinti in opposition. The rumored Super PAC may be fronted by residents of Applied Housing, a group of mostly Hispanic residents considered pliable to arm-twisting at election time. Applied Housing renovated many buildings in recent decades in Hoboken creating institutional subsidized housing under the control of the Barry family. Joseph Barry, the former head of the successful developer family was sentenced to 25 months in prison back in 2004 for giving approximately $115,000 in payoffs to the former Hudson County Executive Robert Janiszewski in exchange for his help in obtaining government funding to build The Shipyard project. More recently, the Barry family has been in the news making major six figure donations to the defense fund of Senator Bob Menendez. Hoboken corruption history in uptown is celebrated with a Bernard McFeely sign and a big middle finger to Hoboken residents. A developer Super PAC is expected to invade the council elections with an eye toward renewing that powerful legacy. Talking Ed Note: Hoboken's recent laid back reform movement just got a wake-up call. Related: the Zimmer-Christie administration war surrounding the alleged Rockefeller Group development approval being tied to state funding of Hurricane Sandy aid.